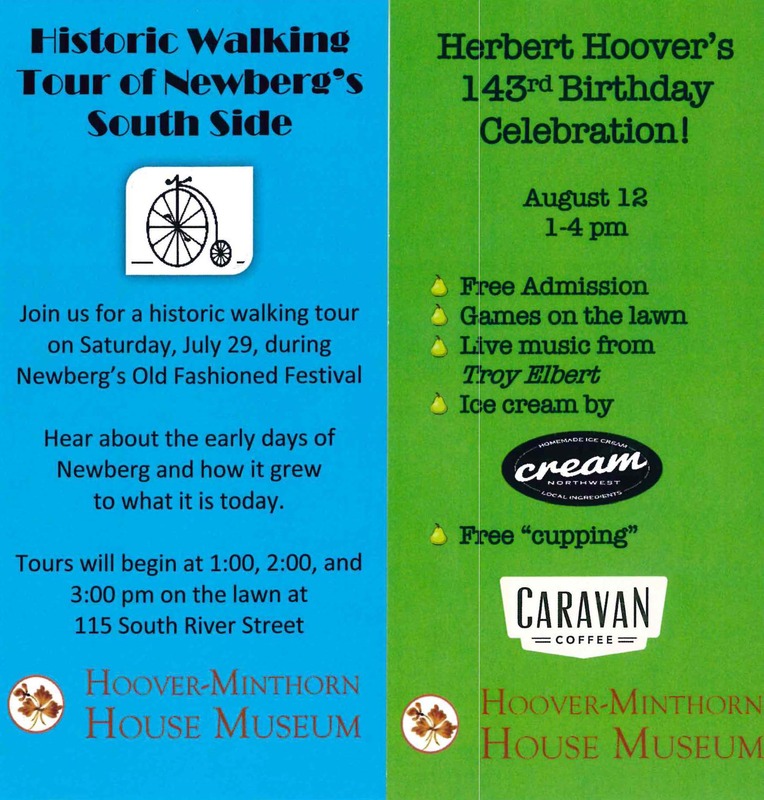 Flyers designed by Hoover-Minthorn House Museum interns Britta Stewart and Alec Deering for summer activities. Congratulations to Josiah Thurston and Kelly Simonsen for both being award the Oustanding Senior History Award! Josh Cayetano is studying abroad in Amman, Jordan with the Middle East Studies Program through CCU. 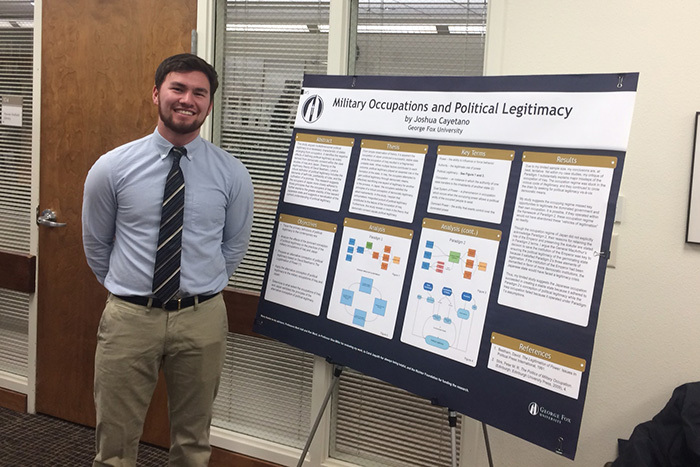 Josh Cayetano received a Richter's Scholar grant to study the role of politcal legitimacy in states emerging from violent conflict, specifically in occupied Iraq and Japan. He also recieved the U.S. Deparment of State's Benjamin A. Gilman International Scholarship. Joel Grey and Caitlin Ross were both awarded Outstanding Senior Award for History. Katya Jenkins received the Outstanding Senior Award for International Studies and Kaylie Moffat received the Outstanding Senior Award for Politics. Great job! Anna Harder was awarded the Outstanding Senior Award. 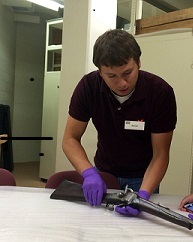 Max Yeley, was awarded a very competitive internship with the Buffalo Bill Center of the West, working in the Cody Firearms Museum located in Cody, Wyoming. He had an internship to work with the senior curator to assist in a redesign of the presentation of the museum collection and also to assist in cataloging. Jordan Keagle was presented with the Outstanding Senior Award. The Public History class visited the Evergreen Aviation and Space Museum on February 28, 2014. View more photos on our History facebook page. Congratulations to history senior, Jordan Keagle, for publishing his Richter Scholars paper, "Eastern Beads, Western Applications: Wampum Among Plains Tribes" in the Great Plains Quarterly, Fall 2013, Vol. 33 No.4 (page 221). Emily Fakkema was awarded the Outstanding History major as well as one of four seniors awarded the C.W. Perry Servant Leader award. Rebecca Stevens was named Outstanding History major. Jay Miller was named Outstanding Political Science major. Jay graduated Winter 2011. Professor Paul Otto took members of his South African history class to Portland on Wednesday, Feb. 29, 2012, to hear F.W. De Klerk, seventh president of South Africa and winner, with Nelson Mandela, of the Nobel Peace Prize in 1993. Seniors Jason Holcombe (history) and Elliot Parisi (political science) joined sophomore Kristina Trindle (international studies and writing). De Klerk spoke on "The Role of Leadership during South America's Transition and Lessons on Contemporary Peace Issues for Today." After the lecture, Mr. De Klerk answered questions submitted by the audience beforehand including the following by Jason Holcombe: "Are you concerned that the current economic condition in South Africa will have a negative effect on race relations in South Africa?" Also attending the lecture was Clint Baldwin, Director of the Peace and Justice Center and Assistant Professor of International Studies. Josh Pierson's article, Experiences of Chehalis Veteran Can Still Teach Us Important Lessons, was published in the Chehalis, Washington, Chronicle on December 3, 2011. Margaret Hollingworth was named Outstanding History major. Jason Holcombe, Johanna Schweitzer and Margaret Hollingworth presented papers at the Phi Alpha Theta Conference April 7-9, 2011, which was held at Seattle University in Washington. Mark Putney was named Outstanding History major. Alex Salisbury and Margaret Hollingworth presented papers at the Phi Alpha Theta Conference April 15-17, 2010, which was held at the Fairmont Hot Springs Resort in Fairmont, Montana. A recent graduate, Sam Craven, was hired as a Sandy police officer. 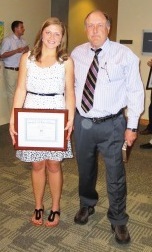 Kaisa Kincaid was named Outstanding History major and also Outstanding Political Science major for 2009.